In the late 16th century, the Danish astronomer Tycho Brahe (1546-1601) established two observatories on the island of Hven, near Copenhagen. 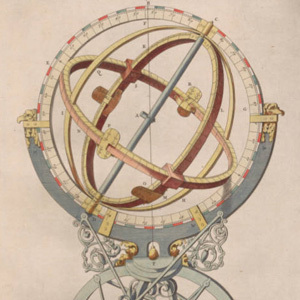 This section from Jean Blaeu’s Grande Atlas, from the French version issued in 1663, describes and illustrates Brahe’s astronomical instruments. Blaeu’shandcolored copper-plate engravings were revised from wood-cuts originally published in Brahe’s own Astronomiae Instauratiae Mechanicae (1598), with the descriptions in Latin; an English translation from Brahe’s 1598 text is available from the Danish Royal Library. The section also gives a map of Hven and plans and descriptions of Tycho’s two observatories, Uraniborg and Stelleborg.